All the coolest jokes and funnies from Penguin Island. Get ready to flap your flippers with glee! How does a penguin build a house? Igloos it together! What’s black and white and goes round and round? A penguin in a revolving door! What’s funnier than a Club Penguin joke? Um – probably nothing, so grab this book of them and give your Penguin pals a hoot! Some funny jokes all based on penguins. When u read it first it’s black and white and suddenly after a few pages it goes to colour which is exciting. Great Jokes! Loved the book and I almost laughed all the way through! It’s a great book. I liked the story jokes. My friends were in fits of laughter when I told the jokes to them. I love the site Club Penguin and I REALLY wanna read this book. ROCK ON Club Penguin! I just love the jokes and riddles inside this book! I like this joke, Matt : I can walk through doors. Matt : I use the door. haha! This book look very funny and soon I will get it. 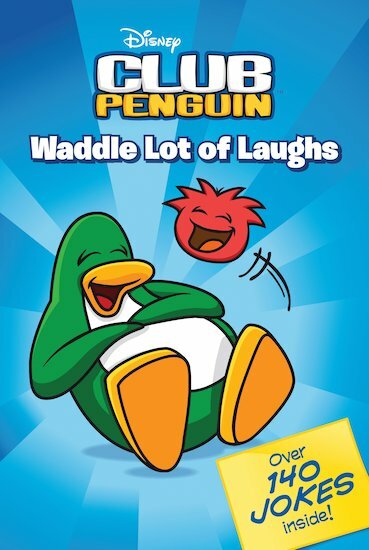 Plus I am a member of club penguin and club penguin rocks and I can not wait until I get this book. This book is so hilarious.So there i was just sitting down and reading it one minute later laughter.Soooooooooooooooooooooooooooooo funnny!!! Also i am a member on club penguin it rocks!!! !